If you were growing up during the 1950’s in this area, I bet you were among those who, at one time or another, picked strawberries either for your parents, grandparents, or a neighbor, or maybe even a farmer somewhere out in the county who hired young and older folks alike when berry-picking season was in full force. Overton County, along with surrounding counties, grew large quantities of strawberries during that time period. Kids my age would often rise before dawn to go to a neighbor’s or to catch a ride out in the country, where pickers were needed in a field of strawberries. A day’s work in the strawberry fields usually ended with the sun going down in late afternoon. Money to go to 4-H camp was often earned this way. Kate and Lewis Bilbrey got most of the kids who lived on Hillview Drive in Livingston to help in the field of berries they grew not too far from their house. Livingston’s very first Strawberry Festival was held on May 30, 1953. This event proved to be a very big success, and even during the years to follow, it was always very well attended. While doing research for this journal entry, I noted articles that appeared in the Livingston Enterprise said that crowds attending numbered between 8,000 to 12,000 people. The 1953 festival was sponsored by 18 civic clubs from Overton, Pickett, Fentress, Clay, Jackson, Putnam, White, and Cumberland counties. According to an article dated June 5, 1953, the Livingston Enterprise reported that R.J. Long, the Overton County Lions Club president, was the general chairman of the event that year. Each festival always included a very big parade in which many bands participated and floats from all different counties were in the line up. Parade float winners in 1953 were Jackson County – first place, Pickett County – second place, and Fentress County – third place. I remember how all the department stores around the square in Livingston had strawberry print material for sale, and one year, my mother used that type of material to make shirts for my father and my two brothers, a dress for herself, and a gathered skirt for me to wear, all of which were made from the same material to be worn on the day of the parade. If I remember correctly, that particular year, all decked out in our homemade strawberry frocks, we watched the parade from in front of the home my great aunt, Linnie McCormick, and her niece, Anna Laura Matthews, shared that stood on East Main Street where the Livingston church of Christ is now. The first beauty contest held that year to crown the Strawberry Festival Queen had 25 entries from Livingston and Overton County. Each county held a contest and those chosen to represent their individual county competed to earn the crown for Strawberry Festival Queen. 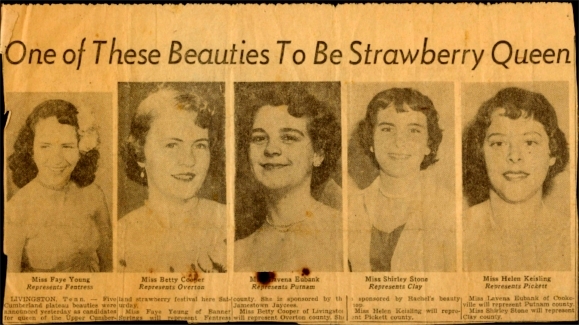 A newspaper clipping from the May 26, 1953, issue of the Nashville Tennessean announced the candidates for the 1952 Strawberry Queen crowning, which was held in Livingston on May 30. Five young women each represented a county of the Upper Cumberland. Counties represented were Fentress, Overton, Putnam, Clay and Pickett. Names and their sponsors of those who entered in the competition to be chosen as the young lady to represent Overton County for 1953 were: Betty Cooper – Rachel’s Beauty Lounge; Barbara Wright – Hatcher Valley Farm; Judy Howard – Doak General Tire Co; Betty Dodson, Fire Dept. ; Jean Wood – Extension Service; Elaine Phillips - National Guard Armory; Betty Jo Pennington – B&B Grocery; Billie Ruth Bilyeu – Goolsby’s Studio; Frances Carlock – Palace Barber Shop; Estelene Hunter – Baugh’s Dept. Store; Mary Stout – Marian’s Beauty Shoppe; Onita McDonald – McDonald’s Grocery Store; Jane Sells – Rickman Home Demonstration Club; Joyce Simcox – Eastern Star; Mary Alice Copeland – B&O Drug Store; Betty Norrod – Beaty Swamp Home Demonstration Club; Frances George – Allons Community; Gloria Sells – Bethsaida Community Club; Jane Ann Copeland – Jaycees; Betty Lewis – E.B. Gray Jewelry Store; Anna Jean Matthews – Patterson and Webb; Elise Smith – Farm Bureau; Norita Copeland – American Legion Auxiliary; Marie Norrod – Alpine Home Demonstration Club; Bobbie Ledbetter – Orpha and Neva’s Beauty Shop. The very pretty young blonde chosen to wear the crown while representing Overton County for 1953 was 16 year-old Betty Cooper. Betty Cooper was the first young woman in Overton County to be crowned Strawberry Queen. The program that year began at 10 a.m. with a strawberry short-cake baking contest, a strawberry short-cake eating contest and a strawberry pickers foot race. Mr. Joe Mabry, station manager of WHUB Radio in Cookeville, was the Master of Ceremonies. The queen who was selected from each of the county contestants was Miss Faye Young of the Banner Springs Community of Fentress County. She was crowned by Buford Ellington, Commissioner of Agriculture. A drawing was held at 4 p.m. that day for a Ford Victoria, given away by Overton County Lions Club. The 1954 festival was held on May 28 and 29 at Overton County Fairgrounds, which was then located where the Volunteer Foam manufacturing plant is now situated on East Cedar Street. Miss Barbara Wright represented Overton County in the beauty contest that year, and a Miss Faye Gentry of Putnam County was selected as the Queen. The program that year included, of all things, pro heavy-weight wrestling and featured some women contestants whose names were Helen Blazes and Belle Stewart. The newspaper article listed this event as perhaps the first professional bout between women staged in Overton County. A portable ring was trucked to Livingston to be used for the wrestling matches. 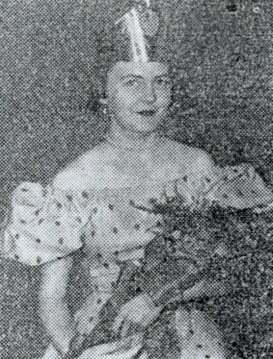 Judy Howard was the 1955 winner of the Strawberry Festival Queen contest. The festival had a total of 15 entries that she was among that year, and the other young ladies competing were Jane Ann Copeland, Frances Carlock, Dorothy Heckathorn, Beatrice Norris, Wanda Ledbetter, Margarite Maynard, Faye Story, Joyce Barnes, Betty Jo Pennington, Mary Francis Wilson, Glenda Sue Lewis, Ada Olean Wilborn, Ruth Ann Eubank and Mary Lois Sells. The 1956 Strawberry Festival Queen winner was Marjorie Vaughn, age 16. Runner-up contestants were Betty Ann Lewis of Byrdstown and Mary Frances Crouch of Jamestown. Dave Overton, Nashville radio and TV personality, served as Master of Ceremonies that year. The festival date for 1957 was June 1. L.P. Jernigan served as mayor of Livingston that year. Entertainment was provided by Lester Flatt and Earl Scruggs and the Foggy Mountain Boys. Senator Estes Kefauver was the guest speaker of the festivities with “Smiling Eddie Hill”, of WSM Radio and Television, serving as Master of Ceremonies. The Strawberry Queen contest winner that year was 17 year-old Carol Ledbetter, with Linda Greer and Betty Jo Pennington serving as attendants. A very large crowd attending the May 31, 1958, festival clapped and cheered as Linda Greer was crowned the 1958 Strawberry Queen. Matilda Bussell and Mary Rose Crawford were her attendants. These three young ladies were invited to appear on the WSM radio Flatt and Scruggs Show, as well as the Bill Jay Program on WLAC Channel 5 television. At 7 p.m. on the evening of May 31, a big square dance and a bop session was held in the street. Flatt and Scruggs provided the entertained that year also. Tony Maxey served as mayor of Livingston. The report that year said that between 8,000 and 10,000 people attended this particular festival. At festival number six held on May 30, 1959, Mary Alice Vaughn, age 17, won the Strawberry Festival Queen crown. Her attendants from Livingston were Martha Gail Mullins and Sue Franklin. Elaine Ellis of Jamestown placed second in the queen contest, followed by Ann Martin of Celina as third. Drue Huffines and Jack Woodward of radio station WLIV were the MCs that year. Judy Dillon won the contest for queen in 1960, with Carol Smith placing second, and Linda Eldridge third. All three young ladies were interviewed on the WSM popular morning radio program, “The Waking Crew”, and were also guests that same day of WSM-TV’s “Five O’Clock Hop”. Serving as escorts at the Five O’Clock Hop for Judy, Carol, and Linda were Larry McNabb, Rodney Webb, and Bobby Ray Smith. C. Ward Brown and Illard Hunter, representing the festival, also attended the hop and presented host Dave Overton with samples of Overton County’s strawberry crop. The Strawberry Queen of the 1961 contest went to Janet Poston. Linda Eldridge received the first runner-up and Pat Ramsey was second runner-up. It was estimated that 12,000 people attended that year’s event. Entertainment was provided by Sue Ledbetter, Leon Cole on the electric organ, the Lakers Top Notch Square Dance Band, and the Pedigo Brothers of Westmoreland. Anna Dean Livingston walked away with the crown at the May 26, 1962, festival. First runner-up was Janice Arney, with Janetta Clayborn coming in second. The largest parade ever with 12 floats and 4 bands, not to mention two live buffaloes, was enjoyed by those attending. The year 1963 was one that Linda Holman reined as queen and was attended by Louise Winningham and Judy Swanson. With the year of 1964 came an end to the festival. Louise Winningham received the last Strawberry Festival Queen crown, while Karen Cope and Fredia Puckett served as her attendants. Representative Joe L. Evins was the guest speaker that year. In May of 1965, it was announced that due to lack of interest, the festival would not be held again. During the years, the Strawberry Festival was such a well organized and well attended event, Breyer Ice Cream Company had a plant in Oakland Park in Livingston that bought the fruit from this and the surrounding counties for several years. An article from the June 5, 1953, issue of the Livingston Enterprise told how that particular season had not been a good one for the fruit processing plant. It described how untimely cold weather, followed by an unusually wet spring, greatly reduced the number and quality of the berries. A total of 700 cans of berries were rejected that year because of spoilage. Evidently 1955 was a better year for the production of strawberries. The Livingston Enterprise reported that more than 100 people were employed by Breyer Ice Cream Company during that season, and that trucks from other processing plants were in a steady stream to and from Livingston. Luke Smith was the manager of the plant at that time. I did not know until doing research for this article that the strawberry plant in Livingston was connected with Breyer Ice Cream, and out of curiosity, I contacted their office in Green Bay, WI, to inquire if the Livingston plant was indeed part of their history. I spoke with Lisa Piasecki, an extremely nice and helpful lady who serves as their public relations representative. She did some checking on my behalf, and sure enough, in one of their company history books, the plant in Livingston and also one in Celina, Newbern, and Portland, TN, are not only mentioned, but a picture of the Livingston plant is shown, too. At that time, Breyer Ice Cream owned and operated seven fruit processing plants in places that included Plant City, FL, Greencastle, PA, Lexington, NC, and four places in Tennessee: Newbern, Portland, Livingston and Celina. Breyer Ice Cream, or Good Humor as the company is also known by, has quite a variety of flavors to pick from nowadays, as anyone who has been to the ice cream section of most grocery stores knows. I looked just the other day at the selection they offer locally, but I didn’t see not a single box of just plain strawberry. Remember those little individual round-paper containers that were sold that had a little wooden spoon to eat with, and how good the ice cream that came in those was? It seems sad to me that the production of strawberries for this area as it once was in the ‘50s doesn’t exist anymore. The fruit used today by ice cream companies is probably grown and shipped to their facilities from places like Florida and California. Although Breyer Ice Cream is no doubt top-of-the-line and possibly the very best of that product made today, I can’t help but think that the strawberry ice cream produced from the berries grown and picked by the many hands that lived and grew up around here during the ‘50s and ‘60s had to taste much sweeter and a whole lot better than it does today. Wouldn’t you agree?